On Saturday morning, the temperature on top of Teton Pass was a balmy six degrees. In the valley, it was negative 18, the difference caused by an inversion that maintained Jackson's wintry reputation as an icebox. But inside an old blue school bus parked atop the pass, things were downright cozy. Seven skiers from Vermont, between the ages of 19 and 22, were getting ready for a tour. 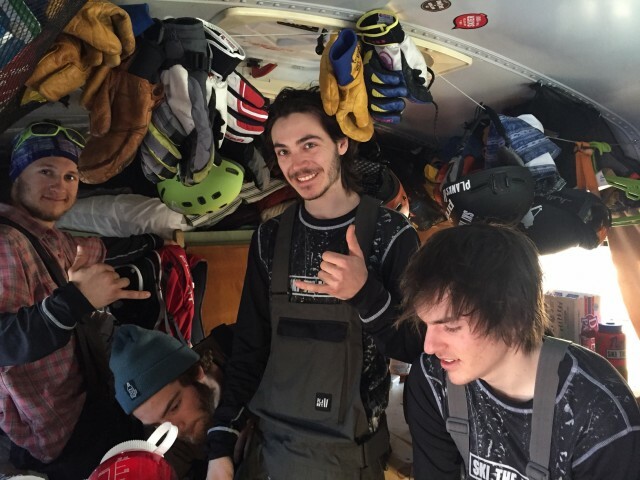 Mostly students at the University of Vermont, the friends had been on the road since December 18, living in the bus and skiing every chance they got. After departing from Burlington, they drove cross-country to Utah, skiing Alta, Park City, Solitude, and Snowbasin. They were now spending four days in Jackson, hitting Teton Village and the pass, before moving onto Montana, and beyond that, possibly British Columbia before heading back to class on January 19. When all is said and done, they will have driven some 6,000 miles in a vehicle that gets about eight miles to the gallon. Midway through, the bus appeared to be—how you say?—lived in. Hats, gloves, goggles, helmets, and jackets hung from every nook and cranny. A double bunk in the caboose showed disheveled bedding and sleeping bags. The whole thing smelled like a mix of rotten boot liners, mildew, and, weirdly, bubble gum. "The main challenge is the close quarters," said Chris Stimpson, 22. "We lose our shoes all the time, or a hat or glove or something. We had to assign sleeping spaces, because sometimes people would just pass out wherever. Other times people sleep diagonally." Momentum for the journey started in the summer, when the friends found the 2003 GMC school bus for sale on Craigslist. It was still yellow and listed for $2,500. Tough negotiators, they talked the seller down to $2,300, went to the ATM, and everybody through down about $300 each. "Basically, how we made it happen is not thinking about it and pulling the trigger on the bus," Stimpson said. "Then we were locked in. At that point it was do or die." Then they got to work outfitting one of the coolest ski rigs you’ll see this winter. They painted it blue, named it "The Notion," and installed a roof rack (they have 14 skis among them), bunks, benches along the windows, and a propane stove to cook meals. They often park the bus overnight at friends' houses, where they can plug in an electric heater for extra warmth. Breakfast is usually eggs or oatmeal, lunch is energy bars and Cabot Cheese (which is one of several sponsors of the trip; they are even handing out samples along their stops), and dinner might consist of spaghetti with elk meat that one of the skiers, Noah Ranallo, shot this fall. They encountered just one mishap so far when they blew a tire in the middle of Wyoming. When the tow truck arrived, they discovered that the bus was too big to fit on the flatbed, so they waited on the side of the highway for nine hours until they could get another tire. Other than that, Stimpson offered this advice for driving the bus: "It's heavy and is kinda sketchy going downhill. And you have to give yourself plenty of time to brake before a red light." Throughout the trip, the friends have been filming a series of webisodes that will be posted later this winter on SkiTheEast.net, and you can follow them on Instagram through the handle @Notion.vt. Look for them this week in Montana, where the plan is to pick up two more friends, bringing their crew to nine. But hey, at least gas will be cheaper.